The barbaric and cowardly enemy seeks to avenge their losses by killing ordinary civilians, indiscriminately bombing their homes, looting their personal belongings, imprisoning and torturing civilians, and generally persecuting them. Over the last few days as the Mujahideen have captured large areas in Konduz province and forced the retreat of enemy forces from the city, the regime forces have retaliated by indiscriminately bombing the city, targeting civilian homes, commercial centers and even social development infrastructures such as schools. This indiscriminate and illegal targeting of city structures has caused large scale damage and spilled much innocent blood. For example last night, eye witnesses spoke to media outlets stating that aerial bombardment in Bagh Shirkat area killed and injured 20 people – all civilians – and demolished civilian homes. Two days ago regime mortar fire and aerial bombardment targeted a large market in the city’s Imam Saheb Bandar area, destroying food stocks and inflicting heavy financial losses to civilians. A day before that regime bombardment hit a large carpet bazaar causing products to go up in flames and inflicting millions of dollars’ worth of damages. 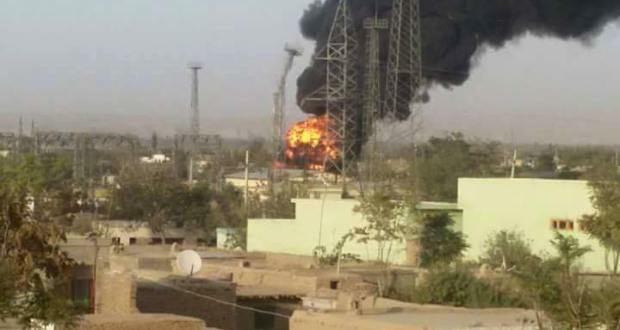 When Taliban fighters first entered Konduz city the regime forces responded by targeting the electricity distribution station and other electricity infrastructure. The regime forces – despite foreign backing and modern equipment – are unable to face the Taliban in frontal battles, their morale has sunk to its lowest level yet, they abandon their fortified bases, their retreat is more akin to a frenzied flight, and they leave behind enormous amounts of weaponry and equipment to fall into Taliban hands. So far the Taliban have established peace in the captured city, they have prevented looting and enabled citizens to attain their basic necessities from local warehouses. Because the enemy seeks to portray the Taliban as a destructive force, incapable of establishing order and peace – which is ironic and amusing when we compare the Taliban’s rule and the current regime’s – they will deliberately target civilians and non-military structures simply to sow chaos and anarchy. It is only convenient that by doing thus they are also retaliating against a populace that is fed up with the regime’s incompetency and willing to welcome an alternative order.